You may have noticed this on our October event calendar: Arbor Heights Elementary (3701 S.W. 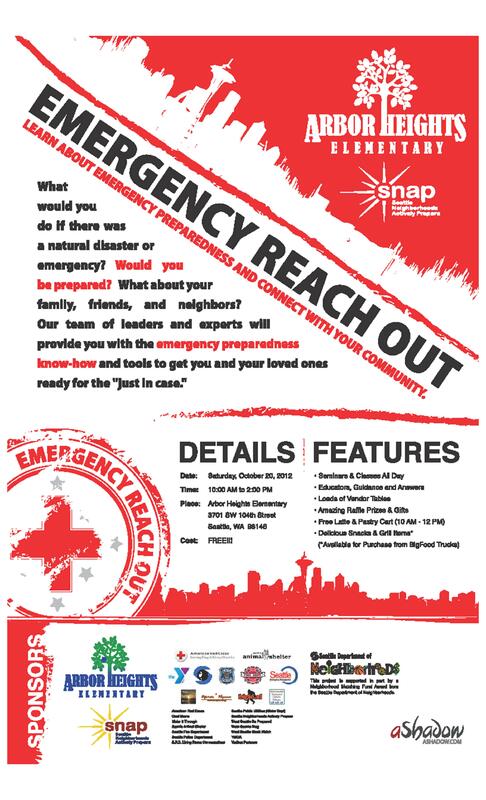 104th Street) is hosting its first-ever “Emergency Reach Out” event next Saturday, October 20th! This free event is open to everyone; you do not need to live in Arbor Heights to attend. It runs from 10 AM until 2 PM, but you can attend all or just the portions that interest you. We’ll be participating, along with other community organizations such as American Red Cross, Cool Moms, Make It Through, Seattle Animal Shelter, Seattle Fire Department, Seattle Neighborhoods Actively Prepare (SNAP), Seattle Police Department’s Living Room Conversations, Seattle Public Utilities, West Seattle Blog, West Seattle Block Watch Captain’s Network, and the YMCA. Our presentation starts at 10 AM; we are the first presenters… & we hope to see you there! If you need an incentive, note that they are providing free lattes and a pastry cart from 10 to noon. The event flyer and the complete schedule of presentations are below; please help pass the word by passing them along to your friends, neighbors and co-workers! As noted above, FREE Latte and Pastry Cart from 10:00 to Noon. Snacks and grill items are available for purchase from BigFood Trucks. Amazing Raffle Prizes and Gifts for attendees! This entry was posted in Announcements, Earthquake Preparedness, Events, Outreach events & festivals, West Seattle Be Prepared and tagged Arbor Heights "Emergency Reach Out", Arbor Heights emergency preparedness workshop. Bookmark the permalink.